So you remember that fabric sample I showed you a few days ago, well here is what I did with it. I have plans to make a crib bumper and all that jazz too, but I am just so thrilled with how this turned out. It is a very simple quilt, you could hardly call it quilting, but none the less I am quite happy with my first attempt. Here is a little close up of the patterns used, I am sorry that I can't source most of them for you, I kinda collected them everywhere. 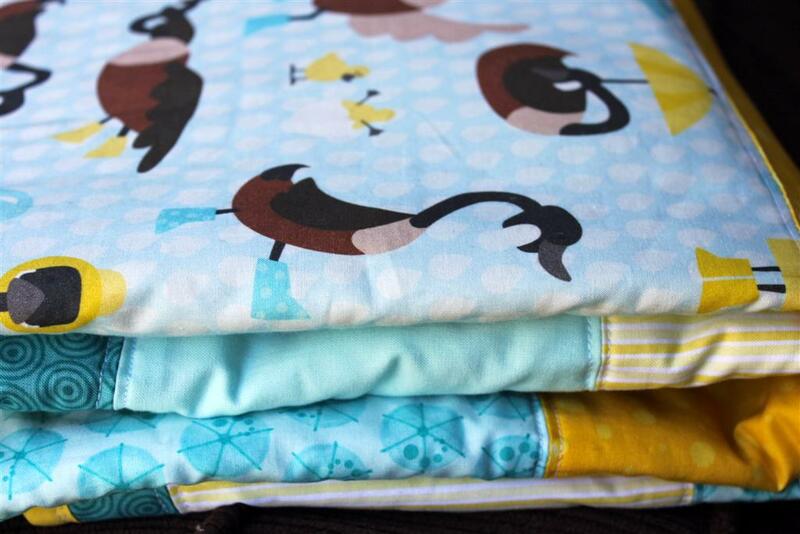 The back of the blanket is solid with the kind of umbrella teal. This is going to be the color scheme of the new baby's room, with an umbrella theme!! I could not think of a more perfect theme for the west coast. I will share more photos as the room comes together. That came out so good! 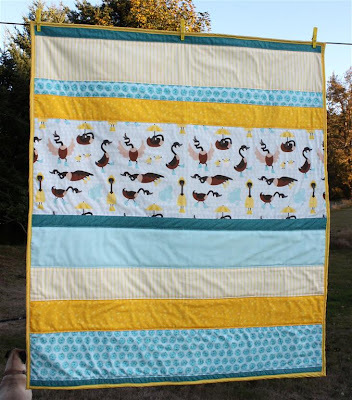 LOVE LOVE LOVE this quilt Lydia!!! SO happy for you! So cute!! Simple, but you wouldn't want to chop up that adorable goose fabric much anyway, it's perfect! OH gosh Lydia, you have more hidden talents!!!! I so can't wait too see this beauty IRL! !